This weekend I visited a fascinating allotment where precision growing, exacting standards and uniformity were the RULE. The crops were pristine. The plot was pristine. Damn it even the gardener was pristine! Science ruled. Ruled with a tape measure, soil testing kits, feeding and watering regimes and exactness. It felt like I’d wandered into an open air laboratory, at any moment I expected men in white coats to come wandering out from the polytunnel holding test tubes emitting mysterious blue smoke. The ranks of vegetables standing to order were certainly photogenic in a benign dictator kind of fashion, but for me it lacked character, spirit or charm. Yes I can learn from such exacting gardening skills and pick up a trick or two to take home with me; but I’m happy to leave the geeky gardening wonders of leeks grown in tubes to others and remain content with my slight seconds, wonky paths, uneven beds, peas escaping their netting, beans straying from their canes and soil that could be “improved”. Mind you I could live without my weeds! Perhaps my sights are set too low but every year I’m frankly amazed when I get to pick a crop. After all these years of gardening I’m still astounded that something I’ve sown has managed to make it to maturity and generally look and more importantly taste like it’s meant to. Maybe I’m easily pleased or maybe I’m not too fussy about a slightly squished strawberry. It tastes like a strawberry so therefore it is. Welcome to my world of wonky, slightly nibbled but oh so precious veggies. I can admire scientific precision and I could see how happy the geeky gardeners were to show off their plots and the immense pleasure they took in sharing their knowledge. I take pleasure from their pleasure. All of which brings me to today’s recipe. Why is it that all the recipes I found for New York style strawberry cheesecake none of them added strawberries into the cheesecake mixture – strawberries were adornments used to top the pud and make the sauce? As I said when you grow your own food the odds are that there will be perfectly edible crops that won’t win any competitions for their looks but will taste absolutely amazing. So I made my own recipe and added the less than perfect looking strawberries into the filling and I’m delighted with the results as I got the taste of strawberries with every bite. That’s my idea of happiness. Cook at 175C for 45 to 50 minutes. If the top starts getting a bit too brown, cover it lightly with a piece of foil. Take it out of the oven and gently run a knife around the edge of the cheesecake tin, this will help to stop the cheesecake cracking and splitting. Leave to cool thoroughly. When cold store in the fridge but cover carefully with clingfilm so the cheesecake doesn’t absorb any other flavours from food stored in the fridge. Strain the mixture through a small sieve into a bowl. Leave to cool a little and then gently pour the sauce over the top of the cheesecake. Claire, that cheese cakes looks divine, Thank ‘God’, or whoever it was looking after your allotment, that nobody nicked your strawberries. Gelnda that’s one of the things I dread happening, the theft of crops, I’ve lost Brussels Sprouts and celery, but not much. I just keep plodding on! I am a bit of an OCD freak but don’t think I would like an allotment with such precision – too much pressure if you ask me. Our garden has taught me that nature doesn’t like to be in a box so hopefully I have a good balance, although I too could do without the weeds. How lovely it would be to enjoy a slice of your cheesecake with a cup of tea right now. Have a wonderful week ahead Claire. ah a fellow straberry plants under the weeds gardener 🙂 My straberry patch is looking very weedy this year, but I’m planning on moving them to some raised beds this autumn so I’ve been even slacker than usual! wow! i make cheesecake quite often and will be adding strawberries as you did. Did their inclusion change the texture at all? It didn’t make the cheesechake watery or thin? I like a nice dense result! you are such a gourmet cook and I love how you experiment and wind up with good results all the time… I would have been afraid to add fruit for fear of a disastrous outcome! hey curiousity…what type of Brit accent do you have? Since I’ve been an anglophile for so many years, (watching wayyyyyy too many BBC dramas) I’ve gotten good at discerning where people are from simply by hearing them speak a few sentences. One of my other big hobbies (besides growing things) is studying languages and how they’ve been impacted by immigration and social classes in various countries. There are so many regional accents in America, and it’s interesting to see how an influx of certain immigrant groups can soften and sometimes change long held regional pronounciations within a few generations. It’s happening bigtime in Boston where I’m originally from. From the late 1800s to around 1980s a Boston accent meant you had a touch of an Irish lilt, invoked the Saints and said Blessed be to God in between dropping every R in sight. No longer…my boys have been living not far from where I grew up for quite sometime now and on a recent visit back I noticed only small pockets of what people think of as the true Boston accent remain. Is London undergoing a similar transition? ps I meant to say you must be nearing countdown ! Mmmmmm….I could go for a slice of that! ps I hope to re-send the package later this week…..
I’ve managed to get things through to Canda, so lets cross our fingers ! I do so understand the desire to control the garden. I plot everything out on graph paper, then measure and stake, run strands of yarn or twine from one garden fence to the other until it looks like an obstacle course, plot placement based on growth patterns, color and companion planting literature, and rake, hoe, dig, to get every weed and trailer of weed root. Or, this what I try to do, though it rarely all works out. Some years I barely have time to scratch the weedy ground and put in the seeds! Either way, I am HAPPIEST with my garden once the beans have climbed over their supports, the tomatoes have outgrown their cages and the squash have taken over the place. Organized chaos! Lovely recipe, Claire, what a great idea to add strawberries to the cheesecake! Thanks! Oh Cindy, I’m with you on the plans, they are in my mind. Some years I get to draw them out, sometimes I just scribble a few lines on a piece of paper and then promptly lose it! I made Strawberry Marshmallow Cake..
Hi Emma, now that does sound good! I love fruits actually and love adding them to my food. Strawberry picking was on my calendar this week. And now nothing will stop me! Focus, focus, focus my friend 🙂 Hope you have a great time strawberry picking! I’ve wondered the same thing about strawberry cheesecake! I’ve been on a strawberry waffle and strawberry muffin kick this season myself. Muffins and waffles sound like a great way to celebrate strawberry season! Gardening should be fun too and that much regimentation sounds too strict. Gorgeous strawberry cheesecake. We’ve got strawberries on offer everywhere around here as well. For a minute, I thought you had made a strawberry sponge flan like I did a couple of weeks ago. 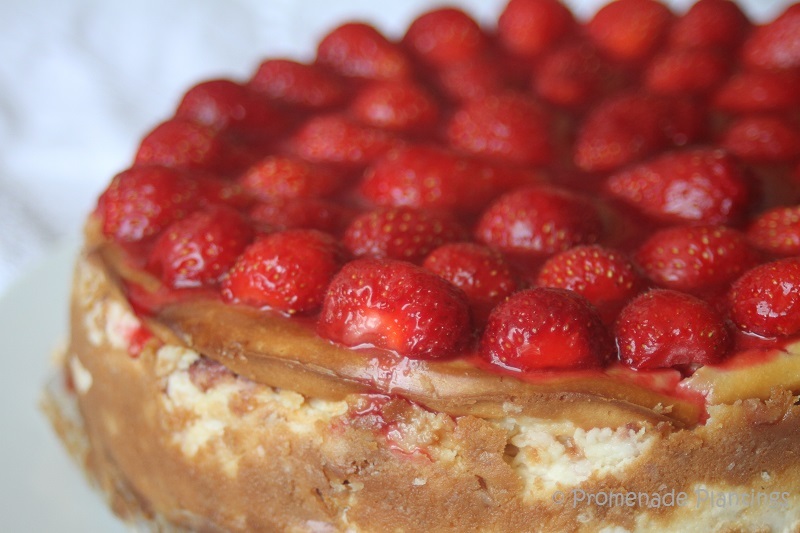 Cheesecake is a great way to enjoy the strawberries especially when you put them inside too. 🙂 I need a bigger freezer so I can take advantage of offers! I have thought the same thing too why no fruit on the inside! Your cake looks absolutely magnificent !! I’m sur ethe purists would be having fits at the thought of fruit inside the cheesecake but I thought what the hell! An dit really did stay nice and firm and kept the texture a cheesecake should have. Phew! Oh, you KNOW of course which side of gardening we fall on – and it’s not the neatly laid out manicured one. We like to think our method of gardening adds to the adventure – we’re never quite sure what will grow, so we’re always thrilled with whatever we can find to eat! 🙂 Your cheesecake looks delish! I was wondering if anyon ewould fess up to geekyness 🙂 Looks like I’m in good company Celia! My approach to gardening is pretty much like yours…I start out with hope, some good plants and seeds and just do it..random, willy-nilly, no perfection but lots of soul! I, too, am amazed when I pick a berry or large green basil leaves for pesto, or pluck a tomato red and ripe from a vine…all that I have planted. If there are miracles, this these moments are it for me. Your strawberry photos are beautiful and I like the idea of fruit inside a cheesecake…novel idea that I shall try. Happy gardening. This looks delicious, Claire. I like the combination of strawberries and white chocolate. I also like unruly gardens where imprecision and nature have a hand. As years have passed so has my mindset 😀 !! Came from a ‘terribly’ neat family, married a ‘terribly’ neat man [his main interest was growing bonsai! ], got yanked out of that by my second husband . . . . love growing things but if the plants tell me they want to grow quirky, they are welcome!! The cake looks lovely . . . . don’t eat anything sweet tho’!!!! Your cheesecake is lovely–and what an inspired idea to put berries into the cheesecake itself! I just made strawberry curd which I will be posting (I hope) tomorrow. Love berry season! I’ve neve rmade a curd before (other than lemon), the problem I have with jams and curds is that I don’t really eat them!! Love them, but neve rseem to get round to using them up! How frustrating about the predators Inger, hopefully later sowings may defeat them…. What a tasty looking cheesecake! I mad ethe cheescake for a dinner round at friends, I don’t really know why I do these things to myself – like creating a recipe that hasn’t been tried and tested before it’s actually needed! Oh that does look tasty. Just the other day I mentioned to a friend that perhaps I should replace all my perennials with weeds, sure would be a lot less work😜! Too funny Eva, but I do undertsnad what you mean! We love wonky veggies! And oh my god – that cheesecake – incredible 🙂 On one of the very few occasions I went to Chelsea (or maybe it was Hampton Court) my favourite garden was sponsored by Age Concern and was an allotment wth a broken down old shed, beans growing up battered old canes and it looked like the “old boy” (who it MUST have belonged to!) had just nipped into his shed for his flask of tea. It impressed me so much more than the formal show gardens! I have a soft spot for formality, think Italian gardens, but I know I lack that kind of precision, besides wonky comedy vegetables are just too good to miss! A perfect garden/gardener? Not here for sure. Whatever grows is welcome, the rest will have to be at home somewhere else. Strawberries are just coming in here so a cheesecake sounds like a perfect way to present them. Wow – on so many levels, wow. Those look so incredibly tasty I can’t even explain how badly I’d love to eat one right now! Definitely need to try this recipe out. Oh my word Claire! I have got to make me this cake! Beautiful! I hope by this time next year my strawberry patch yields enough strawberries to make this gores cheesecake. It really is special–I love the addition of white chocolate. Your comment about “benign dictator” character made me chuckle. 🙂 I admire well ordered, pristine gardens, but in the end mine grow the way they want to, regardless of my efforts! Your allotment always seems to produce a bounty, so I’m certain it is a beauty, too! Beautiful post and the pictures make me want to bite my computer screen to sample those gorgeous strawberries. Awesome blog! Like cheesecake anytime. Will try this delicious recipe for sure. Do check out my blog at ParsiCuisine.com for indian desserts, i recently made aFig Almond Cake check it out. Do you have any idea how to make chicken marsala?